Father’s Day means a lot of different things to different people. For some it’s a celebration. For some, the day evokes painful memories. And still, for some others, it’s a day of mourning. But for me, it is all three. Without taking the time to give a full background on my lineage, my family situation is complicated, to say the least. And each Father’s Day brings mixed emotions. I mourn the loss of my grandfathers, with whom I was barely able to forge relationships. I recall painful childhood memories of my own father and the odd circumstances that continue to plague our relationship. I watch my wife as she celebrates me but struggles with her complicated history and loss of her father last year. Amidst all that, I celebrate the day with my own children, showered by their love and affection. And the combination of those things will make this holiday different from all others for the rest of my life. I have witnessed amongst my own circle friends that I am not alone. I imagine that there are plenty of other people out there with their own complicated situations. Absent fathers. Always present fathers. Fallen out fathers. Unbreakable bond fathers. No good cheating fathers. Devoted fathers. Lost fathers. Returned fathers. And if your relationships are complicated in any of these ways or in any of a million other ways, you might not know what to make of Father’s Day every year either. 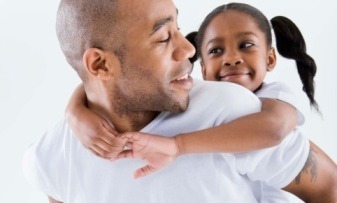 This can be especially hard for folks in Black communities who are encouraged to only celebrate the positives about Father’s Day. People who society claims are incapable of having whole families so we, sometimes, try to compensate for that. Black masculinity is a fickle thing on its own. Rooted in contention with White maleness and historic slavery, it presents a quandary which many of us have to grapple with every day. Inter-generational baggage and perpetual exclusion from the “norm” in this country means that Black fatherhood operates in a sort of mythological way. It’s as if it can only be good or bad. Like, complicated, sometimes weird, and difficult aren’t also options. Because of all this, some folks, like me, often feel silenced on this day. Rather than expressing and exploring our very valid, very complex familial relationships with our fathers or as fathers, we kind of take a backseat to the mainstream holiday’s implicit requirements. If you are like me, and I expect many of you are, I don’t have any special advice or guidance to offer. What I do have is understanding and proof that you aren’t the only one. There are many of us who probably won’t be posting status updates on Facebook about our dads. There are a lot of us who won’t circulate pictures, not because we don’t want to, but because we don’t really have very many pictures with our dads. While I am incredibly blessed to have three beautiful children who love me, who celebrate me everyday, who run into my arms after a long day at work, who climb in the bed with me on Sunday mornings, I am also a man who struggles with the totality of my experiences with Black fatherhood. And I am getting more and more okay with that every year.